Baseball Schedule Stickers / Decals are sure to draw attention and get your message across.... indoors or outdoors. These 4 x 6 rectangle shape with square corners vinyl stickers, decals, labels come cut to size and ready to be handed out. They are very durable and printed in beautiful full-color (four color process). They are very easy to remove. They can be stuck on any smooth surface and removed without any damage. Your choice of pro baseball team... showcase your team spirit all season long. Adhesive will not leave residue behind when removed. 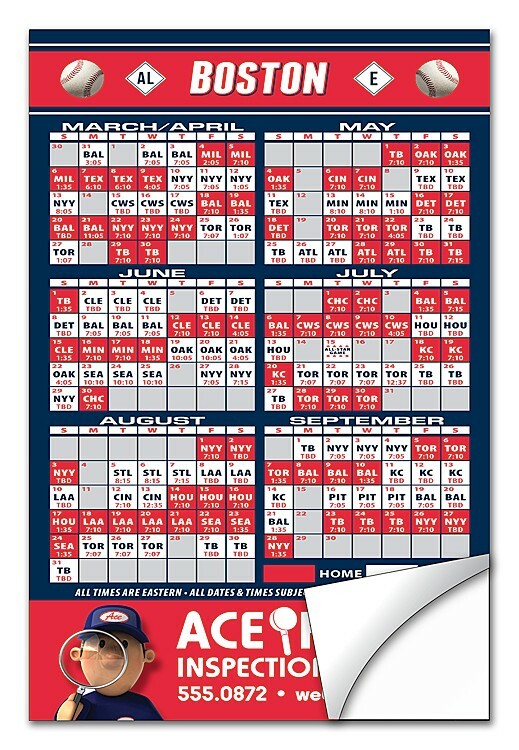 Price includes stock baseball schedule of your choice, printing in full-color (four color process) and UV-coating on one side only. Various schedules may include TBD's for game and/or times when order is received 3 weeks prior to opening game week. Exact color matches, metallic and fluorescent colors not available in full-color. Custom Backer Imprint not available.